After the success of Final Fantasy XII: The Zodiac Age and Square’s announcement that Secret of Mana will be getting remade for the PS4 and Vita, it’s clear the company wants to see its deep back catalog live on, but there are a few games in particular Square Enix should think about reviving sooner rather than later. Beginning with Kingdom Hearts HD 1.5 Remix in 2013 and moving later that year to Final Fantasy X and X-2, Square Enix has slowly been giving some of its best games an HD face-lift or, in some cases, full-blown reworks. While the company has discouraged fans interested in HD remasters of games like Final Fantasy VIII and IX, there are plenty of other games in Square Enix’s repertoire that are worth revisiting but aren’t currently easy to access on modern platforms. Probably one of the best games on PS1 and quite possibly one of my favorite of all time, Yasumi Matsuno’s Bordeaux-inspired dungeon-crawler has some of the best characters and dialogue I’ve every encountered. Prior to director Christopher Nolan using unreliable narrators to subvert audience expectations in a blockbuster, Matsuno did so in a super grindy JRPG. The Shakespearean influences in the game are clear, and hold up no matter what, but the game’s blurry fusion of pixels and polygons don’t . They do, however, look great on high resolution using an emulator, which is why I’m confident Square could do the same in porting it to current day systems or PC. Vagrant Story might not have seen the financial success of something like Final Fantasy VII, which achieved HD crispness on PS4 in 2015, but it’s no less deserving. Another game that stands out among the PS1 golden era for the genre, Xenogears could stand not only to get a cleaned-up looking port, but also one that slightly recuts the third act to be less text-heavy and nonsensical. That said, the continued success of the Xeno-brand is a testament to vision laid out in Tetsuya Takahashi’s original project. It was colorful but grim, and somehow combined Dragon Ball Z-style turn-based combat with hulking mechs in a convincing way. I also can’t think of a better candidate for the new fast-forward option Square added to its remasters with The Zodiac Age. 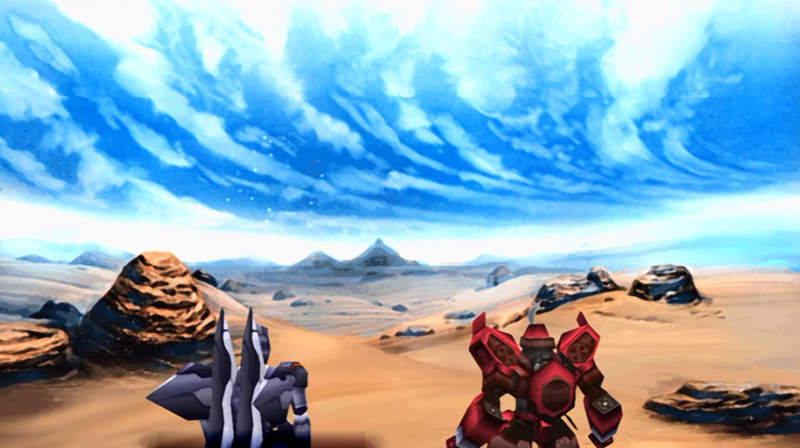 The stories, characters, and boss fights are worth bringing Xenogears into the modern era, and a couple of small mechanics could help paper over the rest and make it easier to endure. The series only went downhill after the first game, but the middling quality of games like The 3rd Birthday have in many ways masked the expert art direction and body horror of the original Parasite Eve. It turns out that Square Enix could make a pretty mean Resident Evil clone back in the day. And like Capcom’s horror series that it borrowed from, Parasite Eve isn’t undone by it’s confusing control scheme or questionable shooting mechanics. Each wintery scene and virus-infected lab is still just as chilling as they were in the late 90s, and teh game’s quasi-turn-based combat is a great example of the heightened tension a game can achieve when it forgoes a strict adherence to bullet realism. The PS2 era didn’t spawn as many classic games as previous eras, but the tri-Ace developed Radiata Stories was one of the console’s rarer gems and more glorious gems. Navigating a persistent world where all the NPCs have their own personalities and goals, Radiata Stories was something between a classic MMO and Animal Crossing if it were transformed into a quest-driven role-playing game. If you’ve ever thought “Majora’s Mask is great, but what if there were twice as many townspeople to track down and help,” then Radiata Stories is for you. It’s also one of the last unreservedly great games tri-Ace had a hand in, as evidenced by the sea of subtle sub-systems that elevate character progression management from a hobby into an art. Even if the game were simply to receive the Star Ocean: Till the End of Time and pop up on the PlayStation Store with pseudo-HD graphics as PS2 Classic, it would be worth it. Yoko Taro has blown up from a cult-favorite to a generally revered designer with the success of NieR: Automata. One of the earliest games he had a part in was though Drakengard, an inscrutable precursor to the NieR series with a beautiful mix of art and music that was held back by awkward pacing. The mix of realism and fantasy, infused with the thematic dissonance of something like Neon Genesis Evangelion, however, is all there, and worth revisiting in light of Taro’s latest work. But unlike some games on this list, it’s less clear that Drakengard’s muddy textures and desolate gray landscapes could stand the test of time, making it, along with NieR’s newfound popularity, a better candidate than most for a complete overhaul. While Square Enix has a number of B-tier series, few have had such a tumultuous fall from grace than Front Mission. In many ways, Front Mission 5 succeeded as more than the just the sum of its failures, and brought the games’ many interconnected and overlapping storylines to a satisfactory conclusion. Not content to ocalize the PS2 game and bring it overseas though, Square instead commissioned the makers of Silent Hill: Homecoming, Double Helix, to create Front Mission: Homecoming, one of the saddest fait accomplis the company’s fans have ever had to endure. Forgoing the grid-based tactics gameplay for third-person shooting, Helix managed to transform the gritty, melancholy war games into a laundry list of excesses and called it a day, all while the series true successor sat just out of reach until it could gain an appreciation from Western audiences years later thanks to fan translations. If Square Enix is ever going to try and rehabilitate the Front Mission name, it could do worse than by starting with remaking Scars of the War for English-speaking audiences.